Ginko employs himself as a Mushi master (mushi-shi), traveling from place to place to research Mushi and aid people suffering from problems caused by them. Ginko's unusual white hair and green eye color is the result of an incident involving a mushi that occurred when he was a child. 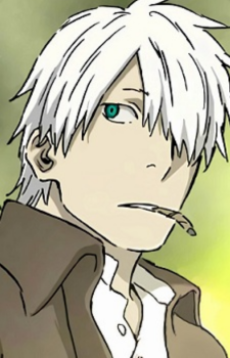 While designing the character, Mushishi-writer and -artist Urushibara actually planned to have the story take place in a contemporary setting. Ginko's rather modern clothes, which do not seem to match the time period reflected by all other characters, still reflect this. Ginko is a rare person who attracts mushi. This inspires his peripatetic lifestyle; staying in one place too long will gather a potentially dangerous amount of mushi. He also smokes constantly in order to keep mushi away. In terms of personality, Ginko is rather laid back, but can be very serious when it comes to protecting people from mushi. He also often stresses that the mushi are not evil, but they merely exist as a part of the nature and try to survive like every other living being. When Nui found him, he was unconscious in the woods, wounded and abandoned. As he had no place to go, Nui decided to care for him instead of making him leave. He went by the name "Yoki" until Nui was consumed by the Ginko mushi, thus changing his name to "Ginko." He lost his other eye and hair color when he tried to save Nui from the Ginko mushi that lived in the pond near where they lived. Nui protected Ginko by telling him to offer them as a sacrifice so the Ginko would let him be. He never saw Nui again and after nearly being consumed by the mushi he adopted the name Ginko to save himself.